I’m deeply, madly in love…[pause for dramatic music..dunh dunh DUNH! ]…with Paparazzi® jewelry! My friend, Laurie Rose, recently launched her Paparazzi® Jewelry business and felt an instant affinity to the bobbles and trinkets that she sells for only $5 per piece! Yep, you read that correctly. Each piece is only $5! Necklaces, bracelets, earrings, hairclips, headbands, rings and even kids’ accessories. Now, every time she posts new inventory on her Facebook group page, she gives me a heads up and I rush with breathless anticipation to see what I can hopefully live without. Fat chance! Of course, it’s more like a race to the finish line to see who can slap a “SOLD” on the piece of choice before someone else gets to it. 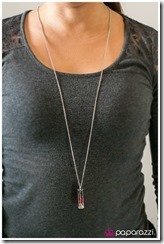 The “Awestruck” necklace, pictured above, is my latest purchase from Laurie’s newest stash! Can’t wait to wear! 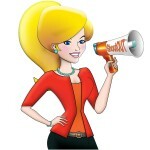 What prompted Laurie to get involved with Paparazzi®? Now, for the good stuff. The GIVEAWAY! 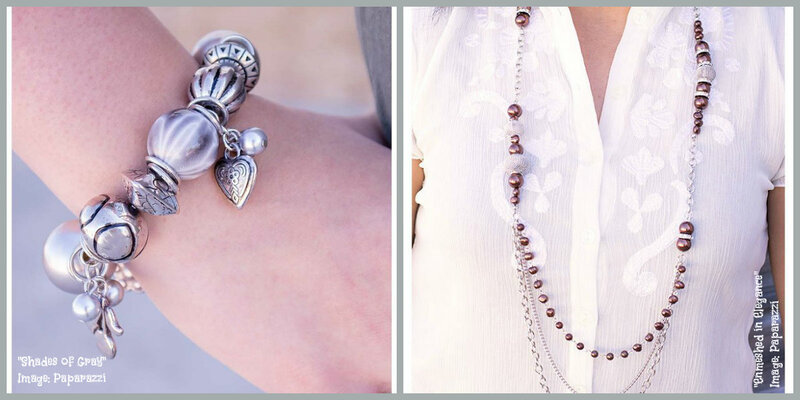 Laurie is giving away two pieces of Paparazzi® jewelry, the “Shades of Gray” bracelet and the “Enmeshed in Elegance” necklace (see below images). (2) winners will be selected via Random.org and each winner will receive 1 of the accessories (pictured above). To enter, complete the mandatory question below by commenting on this article as to which piece on Laurie’s website you’d like to own. Unlock bonus entries by following the instructions for extra entries. ****** Terms and conditions: Giveaway ends January 7, 2016 at 12:00 AM EST. Open to Residents of the US only. Prizes cannot be shipped to PO Boxes. Winner will be selected by Random.org and be notified by email. Winner has 48 hours to respond to email notification before a new winner is selected. Please note that “ShoutOUT®”, “ShoutOUT Tampa Bay”, and “ShoutOUT Enterprises, Inc.” are not responsible for sponsors that do not fulfill their prizes. The product provided for the review was free of charge from the company. There is no purchase necessary to enter this giveaway and is free of charge to the winner. Opinions expressed are completely my own and were not influenced by any form of compensation. Facebook, Twitter, Pinterest, Instagram and Google+ are in no way associated with this giveaway. By providing your information in this form, you are providing your information to ShoutOUT and the sponsor of this giveaway with the express purpose of fulfilling the giveaway. ShoutOUT® does not sell or share personal information. The only purpose of the information collected is for the purpose of contacting the winner. This entry was posted in Blog, Giveaways and tagged #ShoutOUTs, giveaway, jewelry, laurie rose, paparazzi. Bookmark the permalink. I love the “Flower Delivery Bracelet”. It was so hard to choose because there are so many awesome pieces. I can hardly wait for the jewelry party! I am happy with my first purchase and have been telling all of my friends and anyone that will listen about this jewelry! My problem too, Kasia! Can I have one of each? Scarfed for Attention is one of my favorites! Love so many of them though! Oh that’s another great one! Am right there with you, Angela! And I just can’t help but smile when I read the names of some of the pieces! I would love to own the Bar None – Brass! I like second hand bracelet.